A 0.039-in.-dia. electrode provides the flexibility to bridge gaps, weld thin sections without burnthrough (such as this 1.5-mm plate) and offers the ability to increase deposition rates and travel speeds on thicker material. The 400-series ferritic stainless alloys (409, 430, 439 and 444) are used for exhaust systems, mufflers, catalytic converters, water heaters and tanks, furnace shells, heat exchangers, kitchen equipment, and other equipment requiring corrosion resistance at elevated temperatures. They usually contain 10.5- to 20-percent chromium, nickel content below 1 percent, limited carbon content and trace amounts of other elements for stabilization and corrosion resistance, such as molybdenum, titanium and niobium. They also come with welding challenges. Often called “ferritic” or “straight chrome” grades, 400-series ferritic alloys cost less compared to alloys with a higher nickel content (e.g., a 304 “18-8” austenitic alloy). However, ferritic stainless has poor weld-puddle fluidity, making it challenging to weld. To compound the challenge, many applications use thin, stamped and formed sheetmetal components. 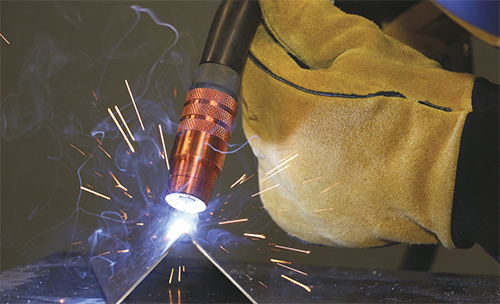 With less precision than machined or laser-cut components, welding operations may need to bridge gaps and otherwise compensate for less-than-perfect fitup. This is always a challenge, but more so when fighting a sluggish puddle and working with thin sheetmetal where burnthrough may result in high reject rates. Table 1—The high alloy content of 309 and modified 307 stainless steels make them suitable for joining 400-series stainless steels and dissimilar grades of stainless to carbon steel. Fortunately, the high-silicon 300-series austenitic steels can be used to weld ferritics in many applications having a more fluid weld puddle and a better ability to bridge gaps. As a result, gas-metal-arc-welding (GMAW) electrodes based on 300-series grades (see Table 1) provide better weld appearance, less rework and faster travel speeds. In addition, using an austenitic filler creates a favorable microstructure in the weld metal, helping combat the tendency of grain growth in ferritic steels while improving mechanical properties. The downside of filler metals such as 309L is that the higher nickel content makes them more expensive. In the eyes of some original-equipment manufacturers, pennies per pound matter. As a more affordable alternative, consider a modified 307 electrode with increased manganese content. Less costly than nickel, manganese acts as an austenitizing agent to create the right microstructure in the weld metal and at a price point similar to that of a 308 filler. A full-penetration corner weld on 1.5-mm stainless made with a 0.039-in.-dia. modified 307 electrode and using the GMAW-pulsed process. In addition to joining 400-series stainless, a modified 307 electrode may be used to weld work-hardenable steels, armor plate and austenitic stainless steels; dissimilar joints of stainless steel to carbon steel; and for overlay welding of carbon and low-alloy steels. With its high manganese content, the modified 307 electrode can withstand dilution without crack sensitivity and provide a sound microstructure in all applications. For welding light-gauge material of 3 mm or less, and to conduct root passes and weld out of position, consider using the short-circuit GMAW or GMAW-pulse process. Recommended shielding gases for short-circuit GMAW with a modified 307 electrode generally include tri-mix blends with helium/ argon/CO2. Helium provides a higher thermal conductivity that helps flatten the weld bead, providing good fusion into the base metal and counteracting the general sluggish characteristics of the ferritic stainless-steel weld puddle. A less-costly alternative is a blend of argon and 1- to 3-percent O2 or CO2, with CO2 preferred due to less weld-oxidation buildup. Modified 307 electrodes are available in conventional North American diameters, as well as the 0.039-in. (1.0-mm) dia. more commonly used in Europe. For all but the thinnest sheetmetal applications, a 0.039-in. electrode provides an optimum balance of properties. Although just 0.004 in. larger than a 0.035-in. electrode, it can provide increased deposition rates and/or travel speeds, yet run at parameters (60 to 140 A, 15 to 21 V) that overlap all but the low end of an 0.035-in. electrode. With less-than-optimal fitup, a larger-diameter electrode will provide 20 percent more fill and help bridge gaps, and do so without risking burnthrough.